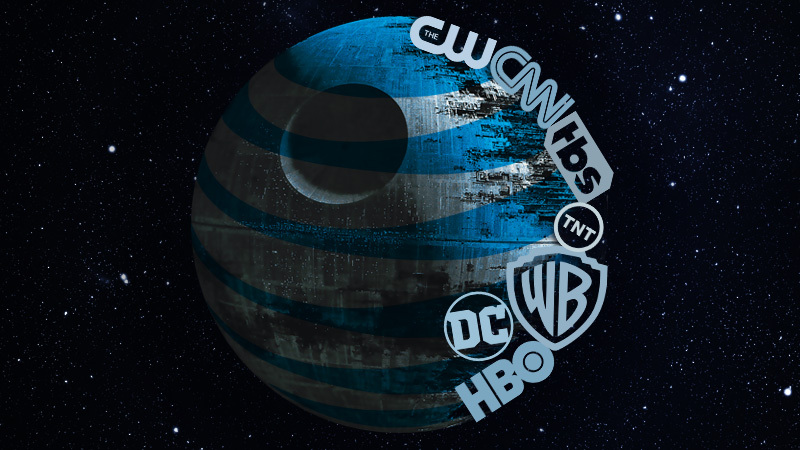 AT&T will own a bunch of new media properties if it is allowed to buy Time Warner. Donald Trump’s victory in the presidential election might be big trouble for AT&T’s attempt to buy Time Warner, and it could even threaten Comcast’s 5-year-old acquisition of NBCUniversal. We can’t be certain that Trump will follow through on statements he made during his campaign or whether the people he appoints as regulators will achieve Trump’s desired outcomes. But we do know that just a few weeks ago, Trump said he intends to block the AT&T/Time Warner deal and wants the government to consider breaking up Comcast and NBC. In a speech in October, Trump declared his opposition to both mergers while discussing his dislike of how media organizations covered the election. News organizations were trying to “suppress my vote and the voice of the American people,” Trump said. “As an example of the power structure I'm fighting, AT&T is buying Time Warner and thus CNN, a deal we will not approve in my administration because it's too much concentration of power in the hands of too few,” he said. Shortly after, Trump declared that Comcast shouldn’t be allowed to own NBC. “Comcast's purchase of NBC concentrated far too much power in one massive entity that is trying to tell the voters what to think and what to do,” Trump said. “Deals like this destroy democracy and we'll look at breaking that deal up and other deals like that. That should never, ever have been approved in the first place, they're trying to poison the mind of the American voter." But now that Trump has won, it isn't clear that his administration will follow through. The conservative wing of the Republican party that would be expected to approve AT&T/Time Warner "lost very thoroughly in the primaries," Feld noted. But the Republicans serving on the FCC today, Ajit Pai and Michael O'Rielly, don't seem likely to lead opposition to the merger. "The ideal FCC chairman or commissioner for Trump would have to be somebody who is pro-regulatory in a lot of ways and anti-regulatory in a lot of ways," Feld said. At this point, the merger's fate in Washington is "a big maybe," he said. Doug Brake, a telecommunications policy analyst at the Information Technology & Innovation Foundation, agreed that Trump's campaign statement isn't necessarily a guarantee that he will try to stop the merger. "Part of Trump’s election strategy was staying unpredictable—it was hard to pin him down on even some of his most prominent policy positions," Brake told Ars. "So it is unclear how strongly he feels about an AT&T/Time Warner tie-up or really any other telecommunications issue. That said, he was quite clear in his distaste for the merger, and no doubt the odds of its successful completion are lower this morning than yesterday." AT&T's $85.4 billion purchase of Time Warner—a company that is completely separate from the similarly named Time Warner Cable—will be reviewed by the Department of Justice and likely by the Federal Communications Commission. Even if the DOJ doesn't have a strong legal case against the merger, after Trump nominates an attorney general he could issue “instructions to try to pursue something anyway,” Feld said. But there is a big difference between Trump opposing a merger and actually blocking it. "A president cannot simply block a merger by fiat," Brake said. "The Department of Justice would have to bring suit and win in court, or if it does end up in front of the FCC, a Trump chairman could potentially send it to an administrative law judge or propose such onerous conditions that the parties abandon the deal. Either way, this will not be an immediate process." The AT&T/Time Warner deal “is all about innovation and economic development, consumer choice, and investment in infrastructure with regard to providing a great 5G mobile broadband experience,” Stephens said. Breaking up Comcast/NBC would be more complicated than stopping AT&T/Time Warner because the companies already merged in 2011 after a lengthy review by the DOJ and FCC, which imposed conditions to mitigate the merger’s potential effects on competitors. The most famous government-initiated telecom breakup in the US, of course, was the breakup of the AT&T Bell System during President Ronald Reagan’s first term. The Bell System breakup was initiated by the DOJ, which could theoretically take the same role against Comcast/NBC under Trump. For example, Trump hired Jeffrey Eisenach of the American Enterprise Institute to help him develop a telecom plan during his campaign. Eisenach is described by Politico as "a crusader against regulation," and he's a staunch opponent of net neutrality rules. “He's been appointing people who are fairly traditional conservatives, but he's been running on this populist notion of going after big companies and concentration of media,” Singer said. The fate of AT&T/Time Warner will also depend heavily on Trump's appointments, he said. It's not just the DOJ that could take aim at Comcast/NBC, Feld said. The FCC could break the company up by imposing rules that limit telecom and media consolidation, he said. “There are a number of means through which the FCC could, by rulemakings, force open the programming contracts, limit the size of the cable operators, go after the bundle of services with rules about cross-ownership of broadcast stations and cable and programming networks and broadband,” Feld said. But Trump is also a declared opponent of net neutrality rules who has promised to issue a temporary moratorium on federal regulations in general. In the telecom policy world, regulators who oppose net neutrality and increased regulation of ISPs aren’t usually the ones trying to stop big telecom mergers. To break up Comcast and NBC, “you’d have to have an FCC that was much more activist than the [Tom] Wheeler FCC," Feld said. Comcast declined comment when contacted by Ars. But it’s still possible that Trump could appoint a DOJ chief who is willing to pursue Trump’s “personal vendetta” against certain media organizations, Singer said. In the same speech in which Trump criticized telecom mergers, he took aim at Amazon’s relationship with The Washington Post. “Amazon, which through its ownership controls The Washington Post, should be paying massive taxes it’s not paying," Trump said. "It’s a very unfair playing field and you see what that's doing to department stores all over the country." Amazon does not own the Post, but the paper is owned by Amazon founder and CEO Jeff Bezos. In any case, Trump’s criticism about Amazon and the Post “is not a traditional antitrust concern. It sounds like more of a personal vendetta,” Singer said. FCC Chairman Wheeler, a Democrat, is likely to step down from his chairmanship after Trump is inaugurated. Trump would then appoint a successor, giving Republicans a majority on the FCC. We’ll have more coverage of the upcoming transition in the near future.